ederal Member for Gippsland Darren Chester, who secured $300,000 to fit-out the upper level of the pavilion at the Traralgon West Sporting Complex, says the space should be ready to use in the middle of this year. The central pavilion at the Traralgon West Sporting Complex is due to be finished within the next five months when its upper level is finally completed after years as an empty shell. Local businesses can now submit tenders to complete the fit-out of the top level of the two-storey pavilion off Grubb Avenue, Traralgon. 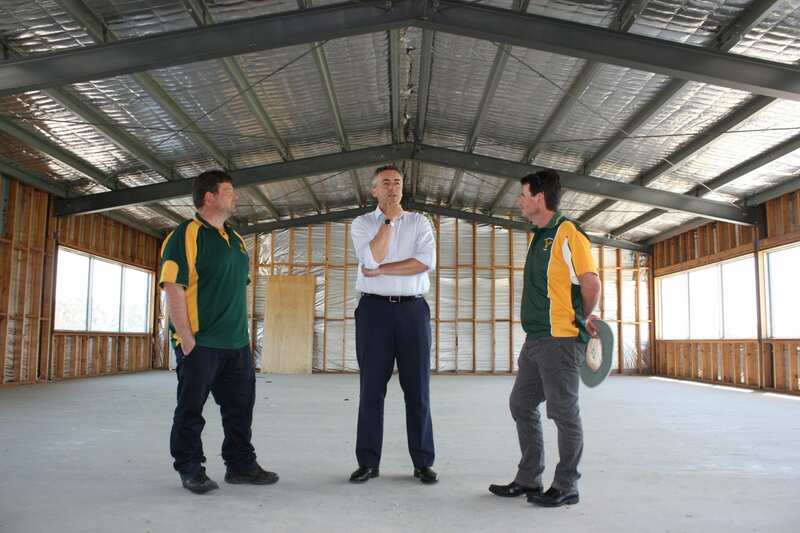 Federal Member for Gippsland Darren Chester secured $300,000 from the Commonwealth Government to complete the fit-out so the space could finally be used as originally envisioned. Mr Chester said the project was moving ahead with the designs finalised and a funding agreement signed between the Federal Government and Latrobe City Council. “A lack of funding has meant the top level of the pavilion has remained an empty shell for the past seven years,” Mr Chester said. “Fitting-out this space, which will include floor coverings, kitchen facilities and bathrooms, is long overdue. When it’s finished, the upper floor will be a valuable indoor area for Traralgon West Cricket Club and West End Football Club. “Raising the money needed to undertake project of this scale is difficult, if not impossible, for community groups. I’m pleased to have been able to get the money needed to complete this project for the benefit of these clubs and the wider community. Work on the pavilion fit-out is expected to be completed by the end of June. Tender information is available at www.eprocure.com.au/latrobe/ . Tenders close at 2pm on Thursday, February 14. The funding for the pavilion fit-out was provided under the Federal Government’s $20 million Latrobe Valley Local Jobs and Infrastructure Package. Other projects to receive funding through the package include the $1.6 million shared netball and cricket pavilion and the $1.1 million netball courts at the Morwell Recreation Reserve, which were officially opened last week. The Federal Government has made a number of significant recent investments in infrastructure in the Valley, including the Latrobe Creative Precinct in Traralgon ($10 million), the Churchill dental prosthetics laboratory clinic ($2.66 million), the Morwell CBD revitalisation project ($1.75 million), and the Traralgon-Morwell Shared Pathway ($1.6 million).